Volunteers are now reaching out to Syrian refugees who now call St. Louis home. Today they dropped off more than $1,000 worth of toiletries to refugee families. 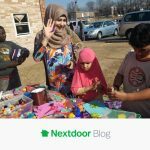 The St. Louis woman organized the effort by reaching out through the Next Door app. The hope is to make transitioning for refugee families to their new home a little easier.